TORONTO – Animal Justice Canada Legislative Fund (“Animal Justice”) today filed a legal complaint against winter jacket manufacturer Canada Goose, asserting that Canada Goose is engaged in false and misleading advertising related to claims that the coyote fur trim on its ubiquitous jackets comes from “humanely” trapped animals. The complaint against Canada Goose was filed with the Competition Bureau, which enforces federal consumer protection laws. Under the Competition Act, companies are prohibited from misleading consumers about their products, including false claims of animal welfare. The complaint alleges that Canada Goose’s website and marketing materials are riddled with numerous misleading claims regarding the welfare of animals trapped for their fur in Canada, including the coyotes used in Canada Goose jackets. Ironically, Canada Goose Chief Marketing Officer Kevin Spreekmester will deliver a keynote address today at the Dx3 digital marketing conference at the Metro Toronto Convention Centre, entitled, “How To Leverage Advertising Without Selling Your Soul”. A protest is scheduled to occur outside the conference. The complaint also alleges that Canada Goose claims that using fur trim on jacket hoods does a better job of protecting facial skin from frostbite than synthetic fur. In reality, no such evidence exists, and synthetic fur and other materials are regarded as highly warm and functional. 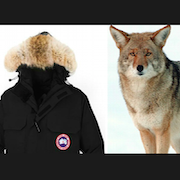 Animal Justice’s complaint seeks prompt action from the Competition Bureau to ensure consumers are not deceived by Canada Goose’s statements about its use of coyote fur on winter jackets. The complaint is available upon request, as well as images of trapping in Canada and trapped coyotes. Leg hold traps, designed to hold animals but not kill them, may still cause up to 20 percent of animals to suffer serious injuries, including fractures, severe bleeding, spinal cord injury, organ damage, limb amputation, or death. Kill traps may cause up to 20 percent of animals to suffer slow, agonizing deaths instead of being killed instantly. Leg hold traps may be checked only once every 24 hours to five days, depending on the province, leaving animals to suffer from hunger, thirst, exposure or predation. In some provinces, there is no requirement to check kill traps, meaning that animals injured but not killed can suffer indefinitely. Animals found alive in traps are typically strangled, suffocated, or clubbed to death, as shooting them would spoil the fur pelt. Traps do not discriminate between species, and endangered species are inevitably caught in traps.